One of history’s most infamous pirates, William Kidd was born about 1645, probably at Dundee in Scotland, and was the son of a Presbyterian minister. Anglo-French pirate vessel that sailed the Caribbean, docking at Nevis. The crew mutinied and renamed the ship the Blessed William, with Kidd as captain. The governor of Nevis, Christopher Codrington, hired the Blessed William as part of a small fleet to protect the island from the French. Since he did not pay them, the fleet made their money from looting. They attacked the French island of Mariegalante, looting goods to the value of £2,000. In December 1695 Kidd was hired to attack any French ships and all English ships that associated with pirates. This was the voyage that made Kidd’s reputation. He bought a new ship, the Adventure Galley, which had 34 cannons, oars, and 150 crew personally selected by Kidd. In September 1696, Kidd set sail for the Cape of Good Hope. The ship began to leak and many of the crew suffered from cholera. It was on this voyage that Kidd first became a pirate, attacking a Mughal convoy. The pirate ships that Kidd thought would offer him rich pickings did not materialize and many of his crew deserted. On 30 January 1698, sailing under a French flag, Kidd captured the 400-ton Cara Merchant and its cargo of gold, silver, silks, muslins and satins. When news reached the Admiralty, word went out to ‘pursue and seize the said Kidd and his accomplices’. Captain Kidd sailed to New York where he was arrested on 6 July 1699 and placed in solitary confinement. A year later, Kidd was extradited to England to be questioned by Parliament but the pirate refused to name names. He believed that his silence would lead his former allies to help him. It did not happened and he was sent to Newgate Prison. He was not allowed a lawyer when he came to trial on five charges of piracy on the high seas and the murder of one of his men (William Moore on 30 October 1697). 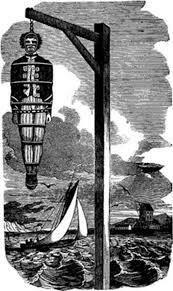 Found guilty, he was hanged on 23 May 1701 at Wapping London. During the execution, the hangman’s rope broke and Kidd was hanged on the second attempt. His body was gibbeted — left to hang for 20 years in an iron cage over the Thames — as a warning to other would-be pirates. While imprisoned in Newgate, Kidd wrote several letters to King William III, begging for clemency.